It’s likely your nonprofit is casting a wide net to find the perfect fit as supporters of your organization. However, we’d all rather spend our precious time communicating with supporters that are an ideal fit. For example, a dreamy donor would likely be someone who feels passionate about your cause, loves to stay involved, wants to support you on a monthly basis and has the funds to do so. That person is highly difficult to come by, and you often spend time reaching out to people who don’t end up supporting your organization long term. Fortunately, there is a method to help you better assess leads before you put too much time reaching out to them. In marketing/sales, we call this lead scoring. However, this methodology can also be applied manually and even just being aware of the practice can help your nonprofit better qualify with whom you’re interacting. Lastly, we use the example of a big donor being the best for your nonprofit. Some say small frequent donors also work for them, so keep your unique nonprofit in mind as you go through this exercise. What is lead scoring for nonprofits? 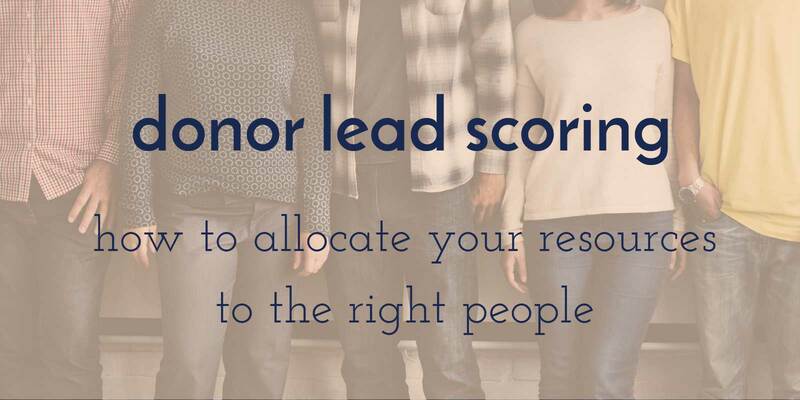 In a nutshell, when we think of lead scoring in terms of donors, a lead with a high score is someone both willing and able to donate to your nonprofit. On top of that, they are currently interacting with you—whether that be online or in person. Likewise, someone with a low score is one who neither has the funds or interest in supporting you. They likely also are pretty inactive in terms of interaction with your nonprofit. Let’s suss this out further with help from ArcStone’s VP of Marketing, Lisa, and Head of Sales, Jenna. They wrote a post on lead scoring for general marketers. Here we apply it to nonprofits. It often occurs that nonprofit development teams get in their own world, doing all they can to sustain your nonprofit. On the other side of the coin, you have nonprofit communication teams reaching out to all sorts of people to spread the word about your nonprofit. If these two worlds had a more deliberate method of assessing their prospects, they could better collaborate. Your development team could help define their ideal donors so that your communication team would know who to seek out. Your communicators would then market towards high-scoring leads. Then, your development team would already know more about each contact once they’re in your nonprofit’s contact list. We often forget that one of a nonprofit’s biggest budget constraints is your time. With lead scoring, you can stop wasting outreach efforts on the one-time donors and instead, give that time to people who keep coming back. With a more systematic approach to donor outreach, the potential for automating some of your efforts goes up. You could have interns or new employees more easily pop into your workflow as there is a guide for them to reference. They’ll know what you’re looking for in donors and how to record that information. What criteria do you use to lead score? There are two types of criteria that go into this methodology. There’s the behavioral (referred to as implicit) and the demographic (referred to as explicit). Think of this as how they’ve interacted with your nonprofit, both on and offline. No one likes to stereotype, but in marketing and communications, painting a picture of your ideal lead is hugely beneficial. You can learn more about audience personas and that strategy in our Audience Persona Development Guide. Say all your contacts start at a C grade. The more they align with the ideal personas you’ve previously mapped out, the closer they are to an A grade. The less they match that, the lower their grade. The leads with A’s get highest priority. 1. Be of a certain age? 2. Be affiliated with a certain group or other nonprofit? 3. Have a similar job role? For the Humane Society, they might find that their most committed donors come from younger families in their 30s, in suburban areas. Likewise, with Feed My Starving Children, their committed donors could be church-goers in rural areas. People give to causes that they are passionate about so define who you think would care most about your cause and go from there. This isn’t to say you should neglect donors who don’t score high enough. Instead, we are hoping to help you allocate your time appropriately when it’s spread thin. We also would love to help your development team work more closely with your communications team, even having a system with which to do so. Lastly, we hope this helps you keep a better record of your audience and really understand how to work with them to support your cause. If you have any questions, reach out to us! We’d love your feedback.